The "Black Cat of Bad Omens". Stage 2 midboss and boss, as well as Extra Stage midboss of Touhou's Perfect Cherry Blossom. Nekomata shikigami of Yakumo Ran, herself the shikigami of Yakumo Yukari. Despite her knowledge of black magic, Chen is rather weak by herself, only gaining a massive increase in power in the presence of her master. She is also weakened by water. Fanworks frequently portray her as a daughter figure to Ran, often exuding a level of cuteness that often gives her epic nosebleeds, as well as being an honorary member of Team 9. 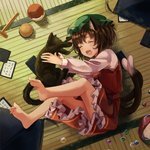 The following tags implicate this tag: chen_(cat) (learn more).